FILE - Residents pass a painting of late North Korean leaders Kim Il Sung and Kim Jong Il in Pyongyang, North Korea, Sept. 6, 2018. One of the first things any traveler to North Korea notices is a huge portrait of Kim Il Sung, pictured in front of an airplane and workers alongside the road as you drive out of Pyongyang International Airport. It's an image that soon becomes very familiar. 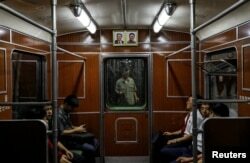 FILE - Portraits of late North Korean leaders Kim Il Sung and Kim Jong Il are seen on a train as it leaves a subway station in Pyongyang, North Korea, Sept. 11, 2018. 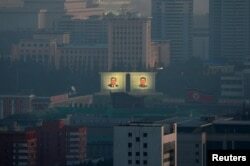 FILE - Portraits of late North Korean leaders Kim Il Sung and Kim Jong Il are seen early morning at a memorial park in Pyongyang, North Korea, Sept. 8, 2018. FILE - A bridegroom wears a badge with portraits of late North Korean leaders Kim Il Sung and Kim Jong Il in Pyongyang, North Korea, Sept. 11, 2018. 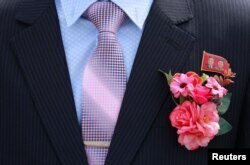 "We, all North Koreans, always wear the portrait badge like this. The most important part of a human body is the heart, right?" said An Sol Yong, a music teacher at a teacher training college in Pyongyang, during a government-organized visit for foreign reporters. All her students wore the badges pinned to their white shirts.